In the 1910s and 20s, there was an outpouring of luxury, limited-edition publications which utilized a hand-stenciling technique known as pochoir (French for “stencil”). The technique, which consisted of built-up layers of gouache paint or watercolor, produced some of the most stunning images of art and fashion history. Marketed to the wealthy elite, the labor-intensive pochoir process was used in publications that were prohibitively expensive to the average consumer. The exclusivity of these publications served only to heighten their appeal. 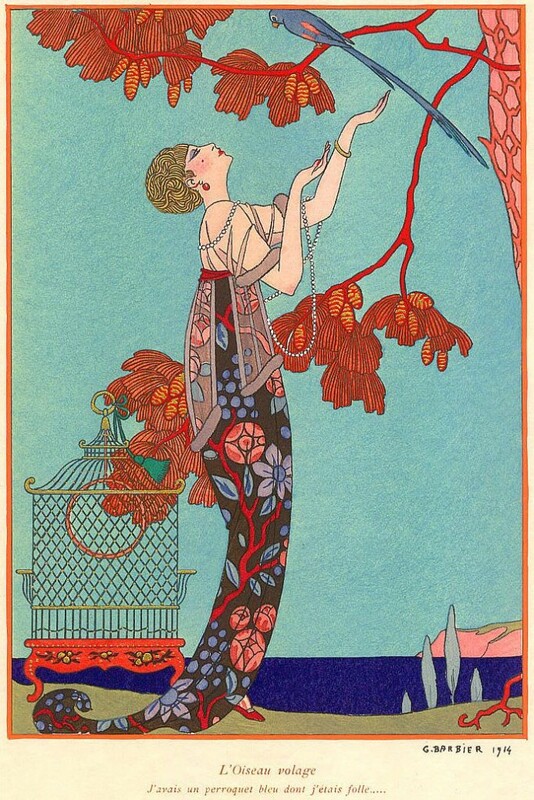 Fashion illustration by George Barbier, from Modes et manieres d' aujourd'hui, 1914. 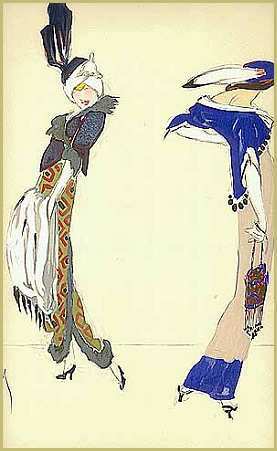 Fashions by Paul Poiret as illustrated by A.E. Marty for the Gazette du bon ton, 1922. The works featured here represent a small sampling of the pochoir technique as represented in the Department of Special Collections and FIT Archives at the Fashion Institute of Technology. The collection contains over sixty publications that feature the pochoir method, many among the most rare and valued in the world. Pochoir was employed in fashion magazines, but also in artist and designer portfolios, as well as in numerous books on poetry and other literature. 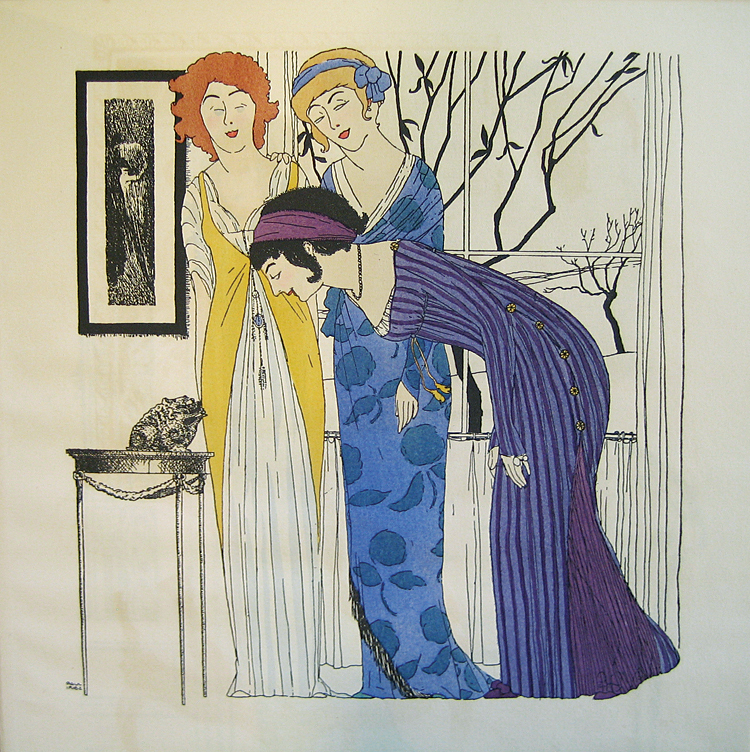 Illustration by Paul Iribe for Les Robes de Paul Poiret, 1908. The self-proclaimed “King of Fashion,” leading Parisian haute couturier Paul Poiret commissioned artist Paul Iribe to illustrate this limited-edition luxury portfolio of his work entitles Les Robes de Paul Poiret in 1908. Speaking to its exclusivity, only 250 copies of this album were produced. Avant-garde designer and fashion revolutionary, Poiret was one of a handful of haute couturiers who changed the face of fashion at the beginning of the twentieth century by introducing un-corsetted, high-waisted silhouettes into their designs. The revolution extended to fashion illustration, largely pioneered by Poiret’s Les Robes de Paul Poiret, who sought a new way of presenting fashion fitting for the artist that he considered himself to be. 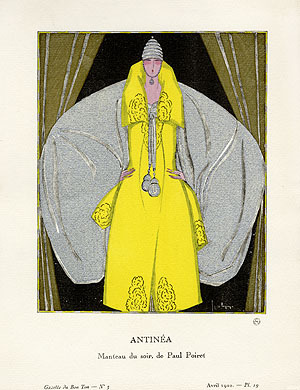 The publication itself, as presented by a distinguished designer and in the pochoir technique, was instrumental in elevating fashion illustration to an art form. This alliance was confirmed when the album was exhibited in the art gallery Le Salon d’Automne in 1909. Les Robes de Paul Poiret set a new standard for fashion illustration that inspired artists, couturiers, and publishers alike. It ushered in a new era of luxury fashion publication that lasted until the early 1930s. Robes et femmes, illustrated by Enrico Sacchetti, was a satirical intepretation of the contemporary trends in fashion, which many deemed to be ridiculous and offensive to good taste. 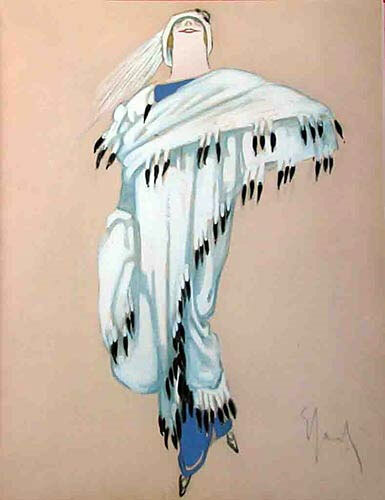 The avant-garde designs of couturier Paul Poiret appear to have been the main source of parody in Sacchetti’s illustrations which depict feathered turbans and wide, hooped tunic dresses–all of which resemble Poiret’s Eastern-inspired designs of the time. The album was printed in a limited edition of 300. 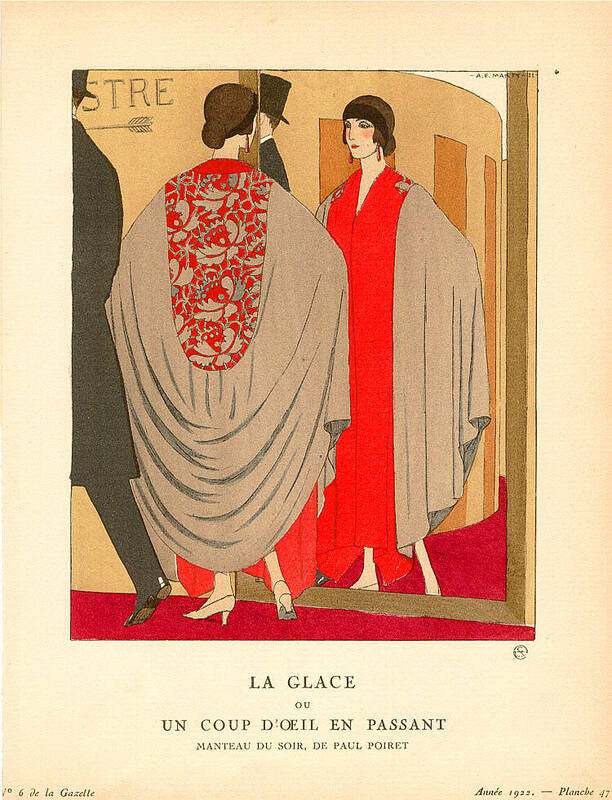 Dress by Paul Poiret as illustrated by George Lepape for Gazette du bon ton, 1920. 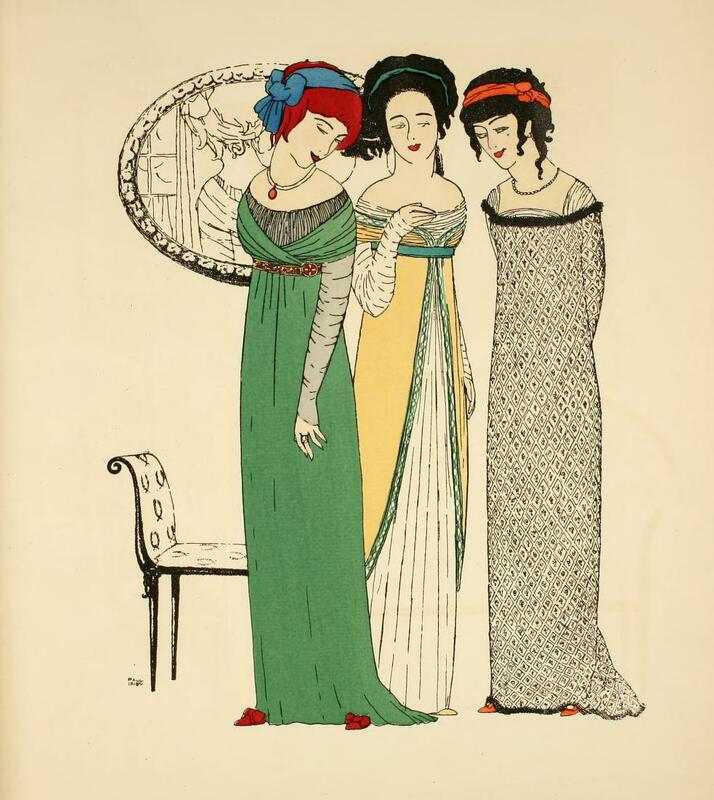 Dresses by the House of Worth as illustrated by George Barbier for Gazette du bon ton, 1920. The magazine featured designs by both couturiers and the artists themselves. Every issue included seven fashion plates rendered in pochoir by the leading artists of the day including Siméon, Charles Martin, Drian, G. Lepape, Bonfils, Boutet de Monvel, G. Barbier, Umberto Brunelleschi and Leon Bakst. Cover of Art. Gout. Beauté. August, 1922. Dresses by Lucien Lelong in Art. Gout. Beauté. October, 1922. Art, goüt, beauté. Feuillets de l’élégance féminine was a monthly French fashion magazine published by the Maison Albert Godde and Bedin (A.G.B. ), a French silk manufacturer that catered to the couture industry. 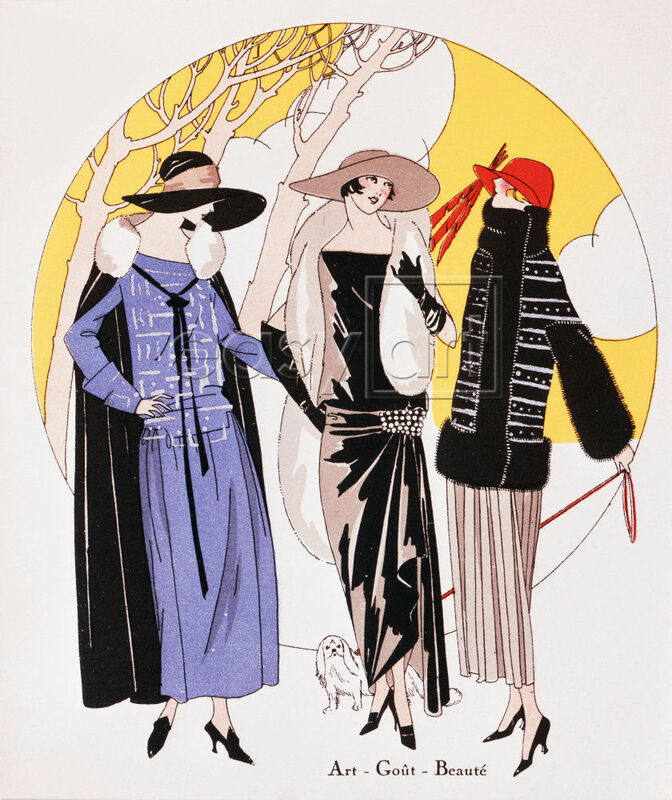 It was in the taste of other luxury fashion magazines of the time, such as Le Gazette du bon ton, in that it employed the pochoir method to present stylized illustrations of the latest fashions from the leading couturiers of the day. 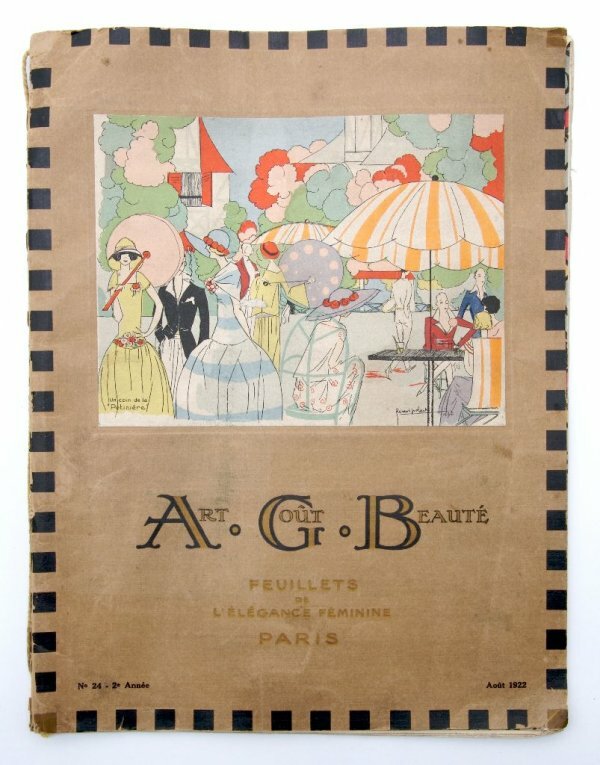 Art Gout Beauté–a clever use of the company’s initials–grew out of a free eight-page bulletin published by the company prior to the war that featured couture creations that utilized the company’s fabrics. As many pochoir publications of the time, the magazine was marketed towards a wealthy upper class, as suggested by the high price of subscription, as well as the couturiers and luxury businesses advertised in its pages. 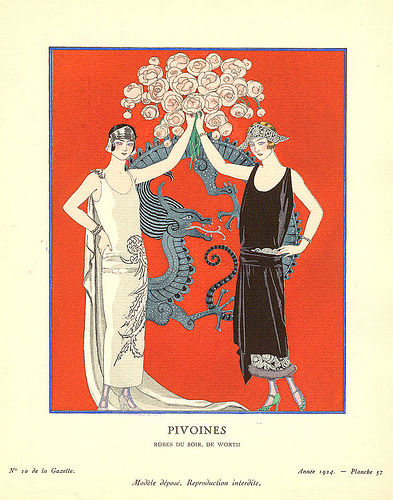 Published from 1921 until 1933, the magazine featured creations from the greatest couturiers of the day, including Paul Poiret, the House of Worth, Jenny, Jean Patou, Lucien Lelong and Jacques Doucet. Special Collections and FIT Archives acquires, preserves, and provides access to a wide range of primary research materials in their original formats across many languages and geographical spectra. Formats include and are not limited to: manuscript collections, scrapbooks, audio and video oral histories (some with transcriptions), sketches, illustrations, monographs, journals, digital files, and other media. Subjects include primarily the apparel industry, fashion, regional costume, textile design, the textile industry, the FIT Archives, and, to a lesser extent, art, architecture, and interior design. All acquisitions support one or more curricula offered at FIT. Department personnel are committed to supporting original research of FIT students, faculty, and personnel, as well as designers and researchers from the apparel and textile fields and other industry professionals. For more information, call 212 217.4360; email fitlibrary.sparc@gmail.com; or visit www.fitnyc.edu/library/sparc. This entry was posted in Treasure of the Month and tagged A.E. Marty, Cassidy Zachary, Enrico Sacchetti, fashion illustrations, Gazette du bon ton, George Barbier, George Lepape, House of Worth, Jacques Doucet, Jean Patou, Lucien Lelong, Paul Iribe, Paul Poiret, Pochoir, Special Collections. Bookmark the permalink.